Popcorn Content: The craft of writing short-form content for social media. 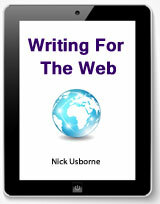 - Writing for the web - online copywriting and content writing. 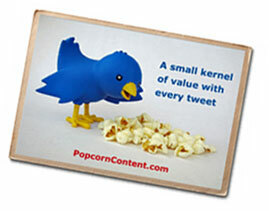 Popcorn Content: The craft of writing short-form content for social media. 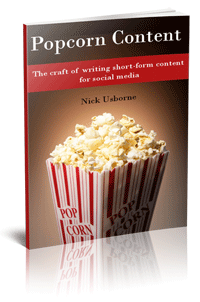 Popcorn Content is a short book about writing social media content. Read it and learn how to write short-form content that hooks, compels and engages. Whether you are writing a tweet, an update intro for Facebook, a post headline for Google+, a comment for Pinterest, or a title for a YouTube video…you need short content that pops. Is writing this kind of short content really a separate “craft”? Absolutely it is. The social media environment is fast-moving, and whatever you say or share not only sinks into the flow really quickly, but is also in constant competition for attention. Whether you are trying to hook readers, or engage in conversations, your social media content has to jump off the page. That’s what Popcorn Content is all about. 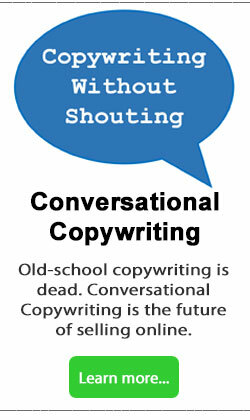 Your social media text needs to be front-loaded with the most powerful words and ideas. It needs to hook readers quickly before you lose their attention. It needs to be intriguing and immediate, so readers click through to read more. It has to be worth sharing, and easy to share. In short, it’s a whole different way of writing. So what’s with the “popcorn” thing? Well, it turns out that popcorn and social media have a lot in common. Popcorn is social. It is generally shared within groups, in theaters, with family in front of the TV, with friends at a party. It’s about sharing within a group…just like social media. Popcorn is a snack, not a meal. Same with social media. Sharing someone’s Facebook update doesn’t mean you now have a relationship with them…you have just taken one small step. It’s the snack before the meal. And it had better be a tasty snack. Popcorn is fleeting. The bowl is full one minute, and empty the next. Same with social media. Your latest tweet is there now, and below the fold a few minutes later. This means you need to write a LOT of Popcorn Content. Using social media is like walking into a crowd of strangers with a bowl of popcorn. By offering these small kernels of value, you have the opportunity to introduce yourself to people and take that first step towards building a relationship. To beat the competition – and it’s fierce – you need to master the craft of writing compelling short-form content. Popcorn Content is just 34 pages long. You can buy it either as a Kindle Single, or as a regular PDF download to read on your computer, or print out for later. 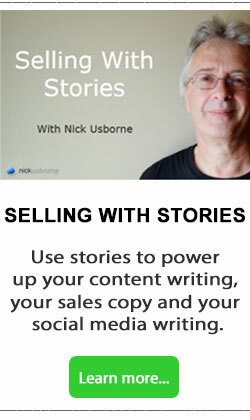 Read it now and write short-form social media content that hooks readers, engages prospects and drives sales. You aren’t part of that social media conversation if you’re not listening. Popcorn content was a great quick read. I wrote a blog post titled: 5 new social media secrets that industrial marketers can learn from Brad and Angelina! As a relative novice, I’ve learned that there are more social media experts than bed bugs (and rats) in NYC. But you have a friendly face, so I think I’ll read this book! You never know what works! it’s true in interviewing, so why not social media?